What is a more perfect combination than pork chops and apple sauce! 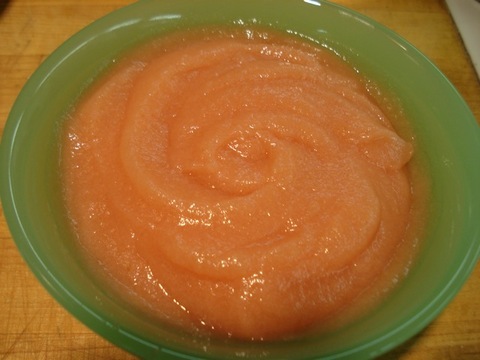 And apple sauce is so easy to make. Just cut and core the apples, toss with 3 to 4 tablespoons of sugar per pound of apples and 1 tablespoon of lemon juice. Add a 1/2" stick of cinnamon if desired. Let it sit for about 20 minutes until liquid forms. Bring to a boil and simmer covered for 20 to 30 minutes until the apples soften. Cool and press through a strainer. The secret to the dreamy pink color is to choose red apples and leave the skin on while simmering.